Molly Jenkins (aka The Garden Doctor) is presenting a class for Don't Ditch Day called "Succulents for Your Water-Wise Garden." It will be an informal and interactive demonstration for people wanting to choose water-friendly plants. The class will also give some attention to solving problems you may have with existing plants. How do you choose a plant for your location? Does the plant do well in pots? Don't all succulents and cacti do well in the sun? Do you need a special soil? Do you need a special pot? What are the most common mistakes for the succulent gardener? Molly Jenkins is a self-taught organic gardener, with fifteen years experience in solving problems ranging from insect control to mysterious die-offs. Specializing in soil rehabilitation, rose cultivation and cacti and succulents, she is able to solve almost any problem simply, efficiently, inexpensively, and organically. Don't Ditch Day will be on Saturday, Sept. 20th from 10am - 1pm at The Growing Experience Urban Farm, 750 Via Carmelitos, Long Beach, CA 90805. For more info, go to the Long Beach Free School page here! 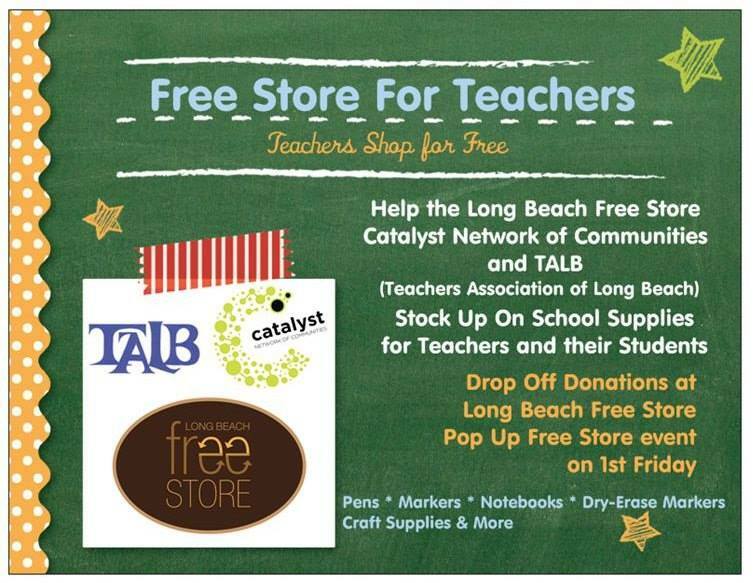 Catalyst and the Long Beach Free School is happy to partner with the Teachers Association of Long Beach as teacher Diane Gulley offers a Rain Stick Making crafts class for kids during Don't Ditch Day. It'll be this Saturday, Sept. 20th from 10am - 1pm at The Growing Experience Urban Farm, 750 Via Carmelitos, Long Beach, CA 90805. Satisfy your curiosity about our natural surroundings as we voyage into our different ecosystems and environment. Join Erlinda Cortez in this Science Academy of discovery into our natural world. The activities are fun hands-on activities so that you will want to engage and explore more of our natural world. It will be held this Saturday, Sept. 20th from 10am - 1pm at Don't Ditch Day hosted at The Growing Experience Urban Farm, 750 Via Carmelitos, Long Beach, CA 90805. For more info, check out the Long Beach Free School page here. Creative Dramatics have been used in and out of the classroom as a tool to capitalize on the natural play of children to create learning experiences using theatre games. Generally improvisational these games help take the participant out of their own element and allow them to think as others through imagination and action. Joseph Torres will be employing a few different games for adults and children to learn and perform for one another. Joseph is an Actor and Director currently finishing his degree at Cal State Dominguez Hills, and hopes to join an MFA Acting program next Fall. He has been active in the local Theatre community for the last 10 years. He is extremely excited to share his passion for Theatre with everyone at Don’t Ditch Day on Saturday, Sept. 20th at 10am - 1pm at The Growing Experience Urban Farm, 750 Via Carmelitos, Long Beach, CA 90805. For more about Don't Ditch Day, go to the Long Beach Free School page here. Catalyst is excited to be partnering with the Long Beach QFilm Festival in screening MAMA RAINBOW as part of the 2014 QFilm Festival-- Long Beach’s longest-running film festival. Fan Popo’s touching documentary MAMA RAINBOW opens with a series of street interviews with passersby about their feelings on homosexuality. The filmmaker follows this with a more pointed question, one which leads us into the heart of Mama Rainbow: “What if your son or daughter told you they were gay?” In the film, we meet six different Chinese mothers, all the parents of gay and lesbian children, who share their experiences with the camera. Though the specifics of their stories are all quite different, each of the mothers experiences their own version of a “coming out” tale—recognizing, acknowledging, and accepting their children’s sexualities. MAMA RAINBOW paints a hopeful portrait of the slowly changing mindset of a culture where the fear of persecution and rejection still makes coming out and living openly a great challenge. MAMA RAINBOW will be showing at The Center on Sun, Sep 14th at 1:30pm. Seating is limited, so we’re encouraging everyone to buy tickets in advance. They are available at http://qfilmslongbeach.com. We hope to see you there! Long Beach’s longest-running film festival since 1993, the Qfilm Festival annually presents narrative features, documentaries and short films that embody the lesbian, gay, bisexual, transgender and queer (LGBTQ) community. Last year’s event was the most successful yet with over 1,500 attendees and featured several West Coast, Southern California and area premieres as well some of the most acclaimed features on the 2013 film festival circuit. With one of the largest LGBTQ populations in the state, QFilms Long Beach is THE queer film festival to see AND be seen. All proceeds benefit The Center and our LGBTQ community programs. The Center Long Beach Q Film Festival’s mission is to present films that embody the LGBTQ community. Along with The Center Long Beach, we advocate the inclusion of all individuals into a free and just community, without judgment or restriction due to sexual orientation or gender expression. Don’t Ditch Day is a day dedicated to learning. We transform a space into a makeshift campus-for-the-day for the Long Beach Free School, where you can attend or teach classes and participate in fun learning activities. Plan to come! We've made it past the halfway point for our Catalyst Giving Chain project and so we're having a gathering to introduce some of the Links to everyone. It'll be a fun time for you to meet them, reconnect with each other, and talk about how we can continue to inspire empathy and understanding in our community. Will you join us? The gathering will be on Sunday, August 10th at 3:00PM at Gina M. Woodruff Gallery, 5555 E. Stearns Street, Suite 203, Long Beach, CA 90815. It's in the area where there's a Target and a Trader Joe's off of Bellflower Blvd in Long Beach. If you go on Stearns Street, it's nearest the cross street of Stearns & Marwick. This is behind Trader Joe's (not in the plaza next to it). Once you find the address and park, there will be a lobby entrance that let's you go upstairs. If you can join us, please RSVP and let us know so that we can plan refreshments and space accordingly. To RSVP, send email to tiffany.wiles@gocatalyst.org. There will also be art on display throughout the gallery and the owner has offered to donate a percentage of any purchases back to the Giving Chain project - so if you're so inclined to get something you like, yay! Want to catch up on giving chain videos? Check them out by click here. On Saturday, August 2nd, 2014, from 10am-3pm, at the Unitarian Universalist Church of Long Beach (UUCLB), families from all over Long Beach and surrounding areas will gather with local maternal and child health organizations and professionals at the 2nd Annual Latch & Link Long Beach: A Community Fair celebrating World Breastfeeding Week. The event is sponsored by UUCLB's Social Action Committee, City of Long Beach Department of Health & Human Services, Berlin Wellness Group, Birth by the Sea, Full Circle Chiropractic, Taproot Midwifery, and Zen Baby Shop. The event will be held at UUCLB's park-like campus located at 5450 E. Atherton St., Long Beach, CA 90815. Remember when you were younger and you were forced to share your toys with the other kids? If your experience was anything like mine, the situation probably resulted in a temper tantrum on your part and an adult saying something like, “You have to share.” Then, they would pry your sticky little fingers off of your favorite toy and hand it to your classmate. As a kid, all my experiences with sharing weren’t the most pleasant, but they did eventually become rewarding in my eyes when I began to see how the other kids enjoyed playing with my toys as much as I did. Sharing is something most of us are taught early on and is a concept we sometimes forget as we progress through life. Last month, I attended an event that reminded me about the importance of sharing and the benefits it has in bringing people together as a community. Catalyst holds an event every month called the Seven-Ten Swap where everyone is invited from the community to come out and participate in exchanging gently used items all while eating and enjoying each other’s company. The Seven-Ten Swap has been happening on the third Friday every month and the community is celebrating its four year anniversary on July 18, 2014 at 6:30pm at 641 Pine Avenue, Long Beach, CA 90802. It has inspired many people across Long Beach to come together as a community. “This is a piece of society that I believe most major cities have lost touch with,” said Pastor Brent Williams, an attendee of the event. “It represents people of different backgrounds coming together,” he continued. Williams also stated how this event is completely different from any other he has attended. There are people of different backgrounds, viewpoints, and age groups gathered together in this small communal space. In business, shareholders own a piece of a company. But here these shareholders are demonstrating what it looks like to collectively own the community together - by giving and sharing and engaging with one another. The Seven-Ten Swap is like the monthly shareholders meeting for the community. “It means a lot of giving and sharing. There’s no way we can turn our backs on one another,” said Gwen H., frequent attendee and volunteer of the event. She described her feelings towards sharing as positive ones and explained she feels the event exemplifies a pay it forward message which we could all apply to our daily lives. When I left this event last month, I took away a healthier outlook towards sharing because it made me realize how easy it is to band together as a community over something as simple as sharing food and clothing. The people around me and the kindness they showed towards one another represents the closeness of a community that I had not seen in a while. I’ll be happy to see it again this coming Friday at the anniversary celebration. Rasheta Driver is new to the Long Beach area and is a full time student attending California State University, Long Beach. She is an intern with Catalyst Network of Communities and hopes to become a positive influence on the community by connecting with the people of Long Beach. Our monthly Seven-Ten Swap is tonight at 641 Pine Avenue (aka 635 Pine Avenue), Long Beach, CA 90802. Come on by for a community exchange and potluck starting at 6:30pm. The double address may sound confusing but don't fret - it's easy to find. It'll be right next to the Art Park/Lot on Pine Avenue between 6th & 7th streets. See map and picture below. As Always - you don't have to bring something to the swap - to take from it. You don't have to bring something to the potluck to join in. If you’re done with it – but it still has a lot of life left in it . . . pass it on. Get something new ( to you) for free!